A globe defender posted a list of 39 things he believes could not happen in a geocentric model. Our @rokro111 addresses each one. 1. Horizon is the apparent intersection of the earth and sky as seen by an observer. The horizon exists whether the earth is flat or round. 2. Objects moving away from the observer reach a perspective convergence of top, sides, and bottom called the vanishing point. Objects in the sky will disappear top-first if we could see that just like objects on land or water disappear bottom-first. 3. Zoom lenses bring objects back into view unless those objects have already surpassed the vanishing point based on perspective convergence. 4. The sun and moon do not set and rise – both enter our view after they are within the convergence vanishing point and both exit our view after they are beyond the convergence vanishing point. Nobody knows what the sun or moon is so to assume it should change in size is an unfounded assumption. One cannot see forever due to convergence. 5. This is important to repeat – nobody knows what the sun or moon is so to assume it should change in size is simply an assumption. 6. Apparent angular velocity is completely meaningless and ignored. 8. Measure the distances around both Antarctica and the equator, have those distances objectively verified, and then make a claim about the distances. Sizes or shapes of land masses or places on earth have no bearing on the shape of the earth. The moon’s orientation is different for observers who are looking at it from opposite positions. (Images from north and south viewing positions). 11. Star fields’ motion is a perspective issue. All celestial bodies in the sky move from East to West. At the equator, it’s a straight East to West movement and inside the equator the stars appear to diverge counter-clockwise and outside the equator the stars appear to diverge clockwise. 12. All things that go up must come down. This is one of the laws of physics. There is no proof any rocket has been more than 25 miles from the surface of earth. Rockets have inherent limitations based on fuel, weight, and speed. All rockets go up and come back down – there are no exceptions. 13. There is no such thing as gravity. Buoyancy adjustment is what happens. Less dense things always align themselves above more dense things. See the Laws of Buoyancy. Signals sent through the air are obtained by only three possible means – from high altitude balloons, land-based towers, or signals bounced off the ionosplane. GPS does not work best in the ocean. There are few land-based towers in the ocean, but ocean towers do exist. For the oceans, LORAN (used since the 1940s) and land-based towers near the shore are the most common, so there are GPS signals near coastlines but not very far out. Most GPS usage is by people traveling on roads, and there are millions of land-based towers that provide GPS, cell, and data signals wirelessly. Signals sent through the air are one of the most unreliable methods to send signals because of the degradation that occurs as distances and obstacles increase. Earthquakes are caused by tectonic movements in the Earth’s crust. Continental drift is based on a speculation (assumption) by Abraham Ortelius in 1596 and that occurrence is not proven as an actual condition. It’s called the Theory of Continental Drift. This has nothing to do with the shape of the earth. Subduction zones have nothing to do with the shape of the earth. Rift valleys have nothing to do with the shape of the earth. Volcanoes have nothing to do with the shape of the earth. Subterranean seismic waves have nothing to do with the shape of the earth. S waves have nothing to do with the shape of the earth. P waves have nothing to do with the shape of the earth. Meteorites have nothing to do with the shape of the earth. Where meteorites come from has nothing to do with the shape of the earth. There is no proof planets are anything other than stars, and there is no proof stars or planets have a prograde or retrograde motion relative to anything. Planets/stars have no influence on the shape of the earth. Parallax requires the earth to move and there is no scientific proof the earth moves. No one can prove the pole star has ever changed. Also, stars have nothing to do with the shape of the earth. Nobody knows how solar eclipses occur and the assumption the moon causes a solar eclipse is an unfounded assumption. Eclipses have nothing to do with the shape of earth. Lunar eclipses are caused by an unknown phenomenon and the condition of the sun and the moon both being visible when eclipses occur, called the selenelion supports the fact that the earth is not casting a shadow on the moon. The solar eclipse has nothing to do with the shape of the earth. Neither solar nor lunar eclipses have anything to do with the shape of the earth. using these simple steps found in this article. Additionally, the size of the sun has no bearing on the shape of the earth. As measured in #13, the distance to the sun is no more than 4,000 miles. Nobody knows what the sun is or how it works. Anything beyond that amounts to guesses and speculation. Lunar phases have nothing to do with the shape of the earth. Tides have nothing to do with shape of the earth. Buoyancy is the upward and downward force at a rate of 9.8 m/s/s. This acceleration is both up and down and is slowed by the medium through which things are moving. Gravity has remained unproven for over 336 years. Laws govern buoyancy but gravity has always remained a theory. There is an official buoyancy report due this month that corrects the wrongly applied usage of gravity as the cause for what buoyancy does. Please note: The theory of evolution, theory of gravity, theory of general relativity, theory of heliocentrism, Big Bang theory, theory of cosmic expansion, and the theory of planetary motion are all guesses and all have to do with convincing people the earth is a spinning ball. Theories stacked upon theories amount to assumptions reinforced by more assumptions. Science is not, and should not be, based on assumptions. The heliocentric model is supported by NASA, and all the space agencies’ collective annual budget of $42 billion. The spinning ball model, after all this time and money, still struggles with many aspects of why it is not the shape of the earth. Ironically, the largest supporter of a spinning ball is NASA, and it has destroyed its credibility so it’s actually moving backwards. 2. The vanishing point argument is ridiculous. As things get further away they get smaller but they never reach the vanishing point. That’s like saying the Earth is flat because it looks flat from the surface. 4. if the Sun and Moon vanish due to convergence that means they are getting a lot further away which would make them appear to change size in the sky. Also you literally have a picture of the Sun setting there and millions of people have witnessed and photographed the Sun and Moon rising and setting, also science easily explains the Sun and Moon. These arguments lack basic logic and it seems you haven’t even tried to understand the science. Hey, its someone with a working brain! 5. The Sun is a giant ball of gas which collapsed due to gravity. The immense pressure resulted in nuclear fusion which makes the sun release massive amounts of energy and stops it from imploding. The Moon is a giant ball of rock which is orbiting Earth due to gravity, and the Earth orbits the Sun while spinning. The Earth’s spin explains the day/night cycle, the Moon orbits around Earth about once a month which explains why it appears in different places relative to the Sun and if you don’t understand phases shine a light on a ball and look at it from different angles. 6. There are scientific theories, for example that gravity curves space. 7. Do you know what distortion means? Changing size is not distortion and if maps didn’t have distortion they would be ROUND. 9. As I said before objects NEVER reach the vanishing point; if the vanishing point was the only obstacle to seeing things we could see to infinity. The poles in the picture either disappear due to the low resolution, atmospheric distortion or fogginess or perhaps, God forbid, they go over the horizon of the curved Earth! 10, 11 This is proof of the round Earth. People in the Southern Hemisphere are upside down relative to people in the Northern Hemisphere, hence a different perspective. Further from the equator you are closer to Earth’s axis of rotation, hence the stars appear to move around a point. Think about it. 12. you have no evidence, again. “What goes up must come down” is just a saying, not a law of physics. With enough fuel and ingenuity rockets can escape Earth’s gravity, or at least get into orbit where they’re technically falling towards Earth in a curve but the Earth’s surface curves away in front of them, and there’s little air resistance so they never (or take a LONG time to) fall back down. 13. Again, no evidence. Buoyancy is caused by gravity, the force pulls harder on heavier things and smaller things get less resistance from things that are smaller because there are less particles below them that would have to move out of the way for them to sink. About the sun…. Nice story. Did you repeat what you were told that someone made-up? Nobody knows that the sun is. You can fool yourself all you want but i don’t have time to waste with your confusion. It’s easier to fool someone than it is to convince them they have been fooled. Scientific knowledge is the body of knowledge gained through repeated testing and observation, not believing something someone made up. Confusion? You are the one that doesn’t know what the sun is, thinks that a scale model is “distortion” thinks the vanishing point refers to what we see the real word instead of 2d pictures of the 3d world, has a model that can’t explain why the sun doesn’t appear to get smaller and smaller before sunset, etc. etc. etc. etc. 17. Continental drift assumes there is magma beneath the crust. Wouldn’t it melt the ice wall that surrounds the “flat” Earth? 18. Explain how tectonics work on a flat earth. No gravity means no leftover heat energy from the formation of Earth resulting in magma beneath the crust. 19. Rift valleys are proof of continental drift; they are places where the tectonic plates are diverging. 20. Again, where did all that magma come from? 21. Well, can you explain them on a flat Earth? 24. Meteorites prove that gravity exists (as does the fact that we do not float off the ground) and if the Earth is a disc under a dome how to asteroids get past the dome? 25. Yes it does. Please explain how asteroids get past the dome. 26. Even if you reject all mainstream science as hoaxes and lies you can still look through a telescope. Planets are big enough to see as discs but you can see details on them. Can you see details on the Sun (the closest star)? 28. Um, stars do have a lot to do with the shape of the Earth if there’s a changing pole star; that proves that Earth is wobbling on its axis. Also since flat Earthers use a 2000 year old book as part of their evidence it’s hypocritical to discount historical recording of stars. 29. So you see the Moon approach the Sun then a circular silhouette appears in front of the Sun? Countless scientists around the world agree that the Moon orbits the Earth. Hmmm… And if I’m facing the Sun and a person walks in front of me the silhouette of a person appears. I wonder what causes that? 30. 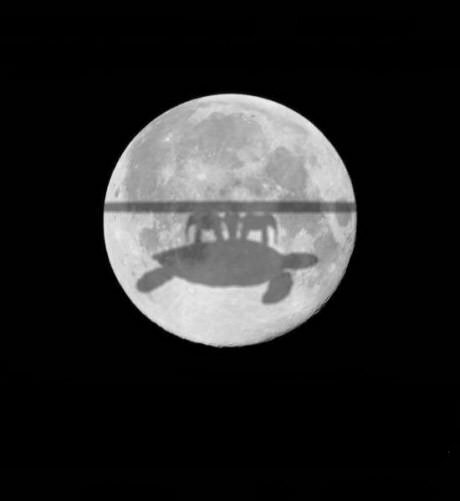 So there’s a full moon and suddenly a round shadow appears on it? Couldn’t possibly be our flat earth! http://i.imgur.com/dSAs5OZ.jpg A selenelion occurs when the sun has not actually risen but can be seen due to atmospheric refraction. I haven’t researched it much but you’d only be able to see a selenelion if you were in a part of the world where it was twilight at the time of an eclipse. I have witnessed a lunar eclipse myself and the sun wasn’t visible. A simple experiment with 2 balls and a light can easily show how eclipses work. 32. Are you sure? Can you explain a solar eclipse on a flat Earth? 33. They’re easy to explain with the globe earth model, but not with flat earth. Hmmm. 34. If the Sun’s 1.4 million km wide according to science yet appears small in the sky I think that it does have something to do with the shape of the Earth. Why is it further away than the dome? https://flat-earth.blog/2018/06/13/measuring-the-sun/ Ummm, what does the “speed” of the Sun (actually the speed of the round Earth’s rotation) have to do with its size? Also where did you get the speed 952 mph from? The moon is closer but smaller than the sun and therefore appears the same size. Simple. 35. If I start running I don’t get bigger or smaller. Please use measurement methods that actually work. 36. Well a lot of evidence and maths goes into those “guesses and speculation”. 37. Yes they do. The Moon is lit up by the Sun (do you have a better explanation?) and the Sun never goes in front of the Moon (see solar eclipses) which means that the Sun is further away than the Moon. How does that work on a dome? 38. Tides are caused by the gravity of the Sun and Moon. Inertia keeps the water in place behind the Earth. Why don’t you check for yourself? The tide is highest when there’s a crescent or new moon and it’s midday. 39. The force of GRAVITY on the Earth is equivalent to an acceleration of 9.81 m/s/s. Also what do you mean buoyancy pushes both up and down? It would cancel itself out (An object will not change its velocity unless acted upon by an UNBALANCED force, try doing a tug of war with someone of similar strength to you; you might be pulling hard but the rope won’t move much unless one of you loses your balance) Buoyancy is an effect of gravity and inertia It takes more force to pull down things with a large volume and more force is exerted on more massive (heavy in a gravitational field) objects, therefore denser objects have more gravity pulling them down compared to less dense objects. You have used weak evidence, incorrect facts and continuously accuse scientists of unfounded speculation when they have studied for hundreds of years and used evidence, mathematics and experiments to prove many things. I trust them more than a person on the internet saying gravity doesn’t exist. The Geocentric model never had a flat earth. Do you know the helio model is a 1000 mph spinning ball and hurls around the sun at 67,000 miles? Did you know the helio model was first concocted when corpernicus saw what he assumed was the shadow of the earth on the moon? Did you know the Fizeua, Arago, Fresnel, Airy, Lorentz, Morley, Michelson, Miller, Gale, Sagnac, Foos, and Boedel all determined the earth is motionless? The point: the geocentric model has the flat earth, not a round earth at its center. With time, information, facts, and discovery, our reality is modified to account for the new information. Take notice – the geocentric model currently has a flat & stationary earth and it remains the center of our existence.